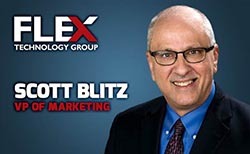 Phoenix, Ariz. – Flex Technology Group (FTG) has announced the expansion of its executive team with the addition of Scott Blitz as Vice President of Marketing. This addition to FTG’s executive team comes at a time when the company is experiencing hypergrowth and aggressively expanding across the country. Scott will support FTG’s ongoing growth and scale by forging closer relationships with our OEM partners and managing the brand across the country.